Tottori is a nature-rich prefecture boasting vast mountain areas and lush forests. If you visit western Japan in the fall months, do not miss out on Tottori's wonderful fall colors! We introduce six wonderful fall foliage spots located in Tottori. Tottori Prefecture covers a vast area with many mountains, forests, and parks, so naturally, it is especially beautiful in the fall. The best timing to enjoy the fall colors slightly differs every year but usually, the leaves change colors between mid-November and early December in Tottori. In this article, we introduce six splendid fall foliage places in Tottori that should be on your list if you visit western Japan during the fall months. Mt. Daisen is one of the best places to enjoy the autumn leaves in western Japan. Because of the high altitudes, the forests in the area change color as early as October. The forests of Mt. Daisen consist mainly of beech trees, which account for the yellow colors in autumn. Maple trees add a touch of red to the landscape making it picture perfect. One way of enjoying your fall trip to Mt. Daisen is hiking up the mountain and taking in the beauty of the surroundings. Visit the halls of Daisenji Temple or Ogamiyama Shrine on your way. Both of these sites are National Important Cultural Properties. Lining the street that leads to Ogamiyama Shrine are hot spring inns, where you can enjoy viewing the fall foliage from their outdoor bathing facilities. Visiting Mt. Daisen in the fall months will undoubtedly be a memorable experience. WiFi Can be used in some of the areas. Suwa Shrine, located in the Chizu district of southwestern Tottori, is a famous fall foliage spot among the locals of Tottori. It is hidden, peaceful shrine surrounded by nature. Built in 1278 as a branch of the Suwa Shrine in Nagano Prefecture, the main hall was once lost to fire but was rebuilt in 1832. The shrine crest consists of a maple leaf. Inspired by this, the locals planted maple trees all around the shrine, which has now become a beloved fall foliage spot. The main building itself is majestic and enshrouded in tranquility. Hikers often stop here to pay their respects on their way through the forest. The stone and wood structures of the shrine, the torii gate, the purification fountain, as well as the wooden staircase leading up to the shrine all blend in with the surrounding mountain scenery. This is a perfect place to contemplate nature in tranquility. The 80 m high Senjodaki Waterfall, located in the Mitaki Gorge on the outskirts of Tottori City, is one of Tottori's most popular sightseeing destinations. There are actually around forty waterfalls of varying sizes along this picturesque valley. The forest surrounding the waterfall is dense and emerald green in summer. In autumn, reds, oranges, and golds will be reflecting in the raging water. A Japanese style red suspension bridge leads you past the waterfall and above the Mitaki Gorge. The entire forest around this bridge is a scenic spot so how about taking a few hours to explore it? The leaves in the area change colors rather early, around mid-October. Make sure to check the forecast so you don't miss out on this breathtaking view. Shikano Castle was built on the top of a small mountain. Although only the ruins of the fortification and the stairs leading up to the castle still remain, the mountain pathway is a popular sightseeing destination for its rich nature and for the great view over the city. This hiking trail is especially popular in spring for its many cherry blossoms but it is just as beautiful in autumn when the foliage of its 600 maple trees turns red. The Shikano district is famous for its Shikano Festival. This festival, which has been designated an Important Cultural Property of Tottori Prefecture in 1957, is held every two years. Halfway up the hill, past the remains of the Shikano Castle Tower, there is Shiroyama Shrine. Shikano Festival is the main celebration held at this shrine. During the festivities, the spirit of the deity enshrined at Shiroyama Shrine moves into the mikoshi (portable shrine) and is being ceremoniously carried all the way into the town and back to the shrine. Once you reach the top you'll have a stunning view over Shikano and beyond. It is easy to understand why some local people would walk this path once a day just to enjoy the view. Access Take the local bus from JR Hamamura Station and get off at Shikano-cho Sougoshisho-mae bus stop. The park is 10 minutes away on foot from the bus stop. Konzenji Temple's main building impresses with its simple beauty. If you visit in autumn you might be surprised to see small trees with delicate flowers resembling cherry blossoms. In fact, they are a special type of cherry blossom tree called Shikizakura ("year-round blossoming cherry tree") that usually blooms in spring and in autumn. It is a very rare type of cherry tree so seeing it here is truly special. The true treasure of the temple is revealed after you enter the main building. The tea room opens up to a 400-year-old Japanese garden with twenty-five different kinds of Japanese maple trees. An old, winding plum tree adds to the atmosphere and shows the true age of the garden. During the fall season, the garden is illuminated at night so visitors can enjoy its beauty twofold. Visitors are not allowed to enter the garden but you can sit down on the porch to view the scenery. Guests are offered delicious tea made from herbs harvested in the garden alongside local sweets. The whole temple has a warm and homely feel to it and it is easy to spend hours talking with the warmhearted hosts, sipping tea and admiring the beauty of this 400-year old Japanese garden. Access 5-10 minutes by bus from Tottori Station. Get off at Kenchonisseki-mae bus stop and walk for 10 minutes. Alternatively, get off at Shiritsu Budokan bus stop and walk for 7 minutes. Price Garden entrance fee: 200 yen. 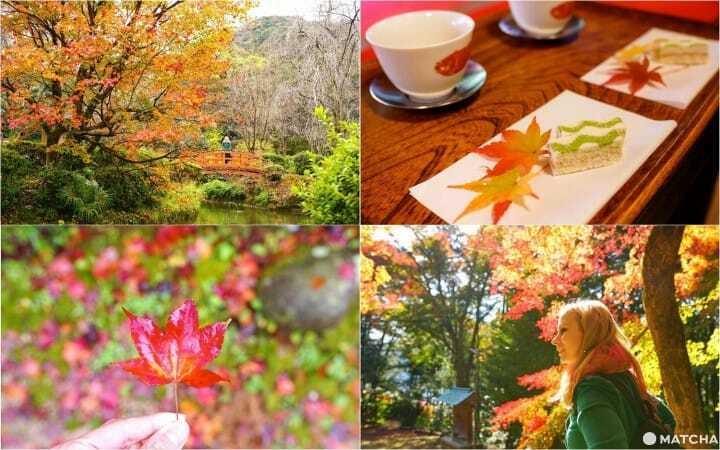 During the fall foliage season, the entrance fee is 400 yen/person. Utsubuki Park is known as a place of scenic beauty in every season. In spring it sees over 2000 cherry trees blooming while in autumn it is filled with colorful fall leaves. It is also famous for its azaleas, which bloom in early summer, and camellias, Japan's beautiful winter flowers. Right at the entrance, you'll see a small Japanese garden with maple and cherry trees. This garden is one of the most popular photo spots in Utsubuki Park. Step on the beautiful red bridge that lies over the pond, and you can see koi carps of every color playing in the pond, following you and asking for food. Once you step into the park, you'll notice that it spreads over a very wide area. You can walk for hours among fall colors without seeing the same spot twice. The main area is easily accessible and even has a playground for children. It is perfect for families, couples or to enjoy alone, no matter the time of the year. Access 15 minutes by bus from JR Kurayoshi Station. Get off at Shiyakusho-Utsubuki Koen Iriguchi bus stop. Tottori is a must-visit if you want to enjoy some of the most beautiful fall foliage spots in Japan. Since it spreads over a large area it is less likely for these spots to get crowded which means you can enjoy your experience without any disturbance. With plenty of Japanese gardens, parks, forests, and mountains, Tottori won't disappoint when it comes to fall foliage spots. Feel free to pick your favorite spot and fully enjoy the fall colors in Tottori. Remember to check out our Tottori Special Feature too!